The Moto 360 Sport was announced alongside the 2nd generation Moto 360, but we've had to wait a little longer to get our hands on it. As you probably guessed from the name, the 360 Sport is a sportier version of the Motorola's latest Android Wear smartwatch, and is firmly aimed at those who like to get active, with its dedicated running app and built in GPS connectivity the headline-grabbing features. The Moto 360 Sport is only the second Android Wear watch to feature GPS, following last year's Sony SmartWatch 3. On paper then, it's an exciting prospect but what's it like to live with? Wareable has had one strapped on for the last couple of weeks, so here's our 360 Sport verdict. The Moto 360 Sport is no Tag Heuer Connected. Let's get that out of the way now. In fact, as looks go, the Moto 360 Sport falls well behind the Fossil Q Founder, the LG Watch Urbane and the Huawei Watch. Heck, even the Asus ZenWatch 2 looks nicer when paired with a suit and jacket. But that's not exactly what Motorola is going for here. It doesn't want people to swap their dressy timepiece for the Sport. It's aiming at the sort of people who wear a digital Adidas watch, or one of those retro-looking Casios, but want a few more features. Just like its GPS rival, the original Sony Smartwatch 3, the Moto 360 Sport boasts a single-structure silicone case and band. Unlike Sony's effort, however, the strap isn't swappable. You're stuck with whatever colour you choose – orange, black or white. Whatever colour you opt for, you'll get a strap that boasts a special UV coating to help fend off sweat, and features air vents at the side, like most GPS running watches, to keep your wrists cool while on the move. You'll also get a strap that picks up dust and fluff like no other smartwatch we've come across. The black version, that we've used, is the most guilty of this grimy crime (as you can see in the pictures). Luckily, the Moto 360 Sport is IP67 water resistant, so you can give it a quick splash every now and again to clean it off. The Sport edition is a tad thicker than the 11.4mm waistline of the new Moto 360 2, measuring in at 11.5mm thick and weighing 54g. The diameter of the front of the Sport is 45mm, which sits it in between the two new 360 models. It feels solid, tight, much like a regular digital wristwatch would. The standby / action dial button has been moved to the 1 o'clock position and the back is a hard plastic one, that covers the heart rate sensor (more on that later). All in all, it's a super comfy, super compact device that definitely feels more sports watch than smartwatch, on the wrist at least. Motorola is making big noises about the display on the 360 Sport, claiming it's a world's first for the new hybrid tech. Labelled 'AnyLight', the 1.37-inch LCD display is naturally adaptable, with the idea being that it can be nicely backlit in dim lighting situations, as per any Android Wear smartwatch. It also means it's easily readable due to the natural reflective tech when out and about in sunnier conditions. We're pleased to report that in practice, the theory stands up. Android Wear is a better prospect all round, not just on the 360 Sport, thanks to the always-on, black and white mode that was introduced in late 2015. The 360 Sport takes it a bit further though by switching between its two modes as soon as it detects that it's bright. As a result the screen is always easy to read, although it's not as punchy as an AMOLED display when indoors and backlit. Like the 42mm Moto 360 2, the display's resolution is 360 x 325, with a 263ppi count. The flat tyre is still there. Sorry, we should have perhaps mentioned that sooner. However, on this instance we'll forgive Motorola as it's more important, on a sports watch, to keep the bezel trim and the ambient light sensors working as they should. It's still flippin' annoying though – especially when using apps designed for a full 360-degree experience. The LCD display is covered in Corning Gorilla Glass 3, so it can handle a bit of rough and tumble on the fly. However, the glass is slightly curved and indented at the edges. This causes a slight warping of the edge of the display with pixels looking distorted. It's only a problem if you look really closely but it's still not ideal. A much safer option, and the one Motorola wants you to use, is the built-in Moto Body software. Built in on the watch, you'll need to add the app to your Android smartphone. Unfortunately, there's no iPhone option just yet. Moto Body will also track lifestyle activities and keep tabs of calorie burn, steps and so on and the smartphone platform is okayish. It's not as comprehensive as Fitbit or Jawbone, but it's easy to use and nicely presented. While running you can swipe through various screens, showing basic metrics on distance, pace and heart rate data. You can free run, or set yourself various goals to achieve. But it's not a Garmin Forerunner. You're not going to get stats on cadence, VO2 max and the like. It's basic running stats for basic running. But it's accurate. Super accurate. Compared to an Adidas miCoach Smart Run (which this writer has used for several organised distance runs), the 360 Sport was always within 100m on distances over 8km. Its GPS lock was also much quicker than the Smart Run. Usually it'd find a satellite within a minute. The heart rate readings weren't as accurate though. Resting heart rate, when sitting still, is fine but once you work up a sweat and get your heart pumping fast, the 360 Sport is all over the place (we tested against a MyZone chest strap). This isn't unique to Moto's smartwatch yet. We've yet to find a reliable Android Wear device for bpm training. Other fitness apps such as Fitbit, Strava and the like are supported – but the Moto 360 Sport is really a one trick sport pony. And that sport is running. We're told cycling features will be added soon, but there's nothing for pedal fans to get excited about yet. Or indeed gym bunnies. A more apt name might have been the Moto 360 Run. This is the boring part of the review. Yes, the Moto 360 Sport is an Android Wear smartwatch and, as such, we should give you our verdict on how Google's wearable OS performs on it. Prepare yourself for a big shock… it's more or less the same as it is on every other AW device. Sure, manufacturers can tweak their watch faces and built-in apps but, essentially, you're getting the same feature set you'd get with even the oldest of Android Wear devices. It's a feature set that's always evolving – Wi-Fi connectivity, Bluetooth music functions, new gestures and whatever else Google introduced in the latest updates – but it's a feature set that's pretty standard nonetheless. Moto has added a few nice widgets to its homescreens, we'll give them that, with the default Sport face offering a range of customisation options. But on the whole, it's Android Wear as vanilla as you'd get from a whole host of other devices. Whether that's a good thing or not is personal preference. Some people love Android Wear, some people are still not sure about it and some people down right hate it. What's clear is that, until Google takes the shackles off, Android Wear is pretty much a uniform experience – albeit with minor tweaks – across the range. It's compatible with iOS, like all the new Android Wear smartwatches, but you'll be limited in what you can do. Check out our iOS / Android Wear guide for more info on what you will and will not be able to do. The hardware – a 1.2GHz quad-core Qualcomm CPU with 512MB of RAM and 4GB of storage – is pretty much the norm for Android Wear now, and performance isn't an issue. You won't see any lag or experience any stuttering apps. The Moto 360 Sport packs a 300mAh battery, which is good for a full day's regular use. Turn on GPS, however, and it will take a hammering. Saying that, we've had the 360 Sport fully charged in the morning, used it throughout the day, gone for a GPS tracked run of around an hour, and still had enough juice to last until bed time. We've measured the battery impact of GPS tracking a few times now and an hour's run will use about 25-30% of the battery. That's with the always-on monochrome stats screen always firing. We managed to do a 45-minute run on just 12% battery, but the watch was automatically turning the display off (while still tracking in the background) every few seconds. Charging is done using a docking station, as with all the other Moto 360s, with a nice progression graphic showing your charged percentage. The Moto 360 Sport isn’t a dedicated sports watch. In fact, the only sport it supports is running. And, if you want in-depth running metrics, you’re going to be disappointed. 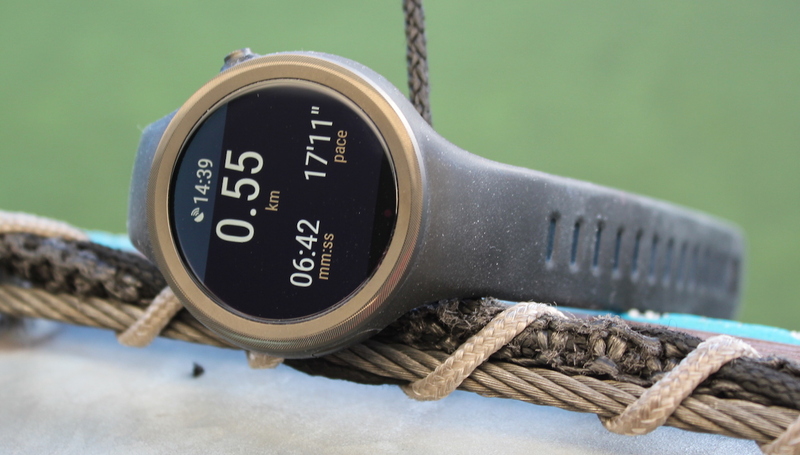 However, if you’re looking to dip your toes in the murky smartwatch waters, and at the same time require an accurate running watch assistant for basic distance and time stats, it could be just the ticket. It’s well priced, well built and is discreet enough to look like a regular sporty timepiece. It’s not spectacular by any stretch but, pound-for-pound, this may well be the strongest Android Wear contender so far.